So what exactly is a wadi? It’s a steep-sided canyon carved by a seasonal (or ephemeral) river. In Spanish-speaking countries, it’s an arroyo. In English, gulch probably comes closest. 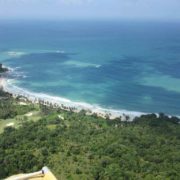 When heavy rain falls on mountainous, parched lands, the water rushes down violently, gouging deep and tortuous ravines. And then the water is gone, or mostly gone, until the next time. Except in Dubai, at the mammoth “Wild Wadi” water park, where an eco-unconscious deluge of water keeps the slides lubricated and the skin on your back. With more than 30 rides, including the terrifying “Jumeirah Sceirah”, Wild Wadi is one of the world’s biggest and most diverse waterparks. And I love waterparks. 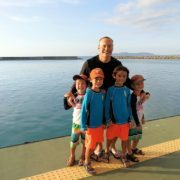 Unfortunately, we had only a few days in Dubai and Nori rightly pointed out that “the kids can to go waterparks anywhere”. So on to Oman! 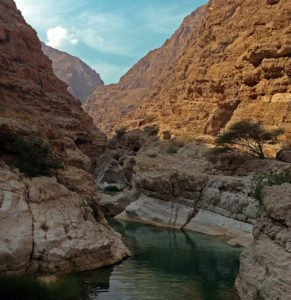 The Al Hajar Mountains rise to as high as 3000 meters within 50-100 km of the Gulf of Oman. And while the capital, Muscat, receives as little as 4 inches of precipitation a year (Portland, Oregon gets 44! ), the mountains get 2-4 times that, with half of it falling in the winter months of December to April. That makes Oman wadi country, and these wadis are really wild. In Dubai, Wild Wadi has a ride called “Flood River”. 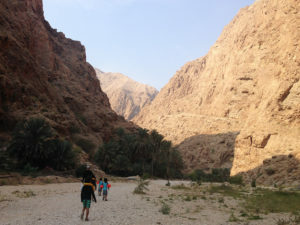 In Oman, a flash flood is the chief risk of hiking, or driving up, a wadi. If it starts to rain, the guidebooks advise, get out or up. After nearly two hours of driving through some of the most dry, cracked and beaten landscapes on earth, I needed some green. 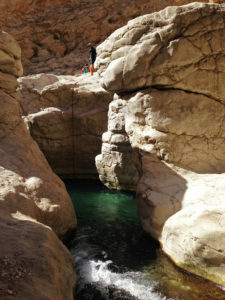 But I knew that Wadi Shab was a full-day activity, so we zoomed right over the bridge that spans its lower reaches and continued a few kilometers more to Wadi Tiwi. With adolescent glee I piloted our Landcruiser up a twisting, narrowing ribbon of asphalt flanked by palm trees and reed-lined pools. Unfortunately, it didn’t last long. We barely squeezed between the homes of a very poor-looking village and then the road just disintegrated. If we had parked the car and hiked further up the canyon, I’m sure the scenery would have been much more impressive. But it was already very pretty and I knew that the boys needed some activity. So we changed into our swimming gear and started exploring the pools beneath the village (I know what you’re thinking, but I tried not to think about it). 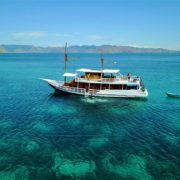 Climbing boulders, swimming against the mild current, bird-spotting and admiring the orange-red canyon walls – it was great fun (despite the slimy algae) and a tantalizing taste of what was to come. That night we slept in Sur, the largest city in eastern Oman. The next morning we drove the 40 minutes back to the Bridge Over the Wadi Shab (sorry, I lived in Thailand too long). 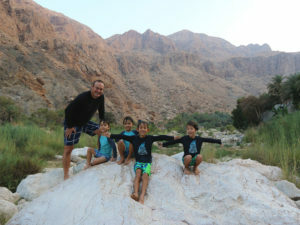 The wadi and its pools are some of the most popular in Oman, so I was glad we had gotten an early start. We paid the equivalent of US$8 for a laughably short ride across the slow-moving river to the trailhead. 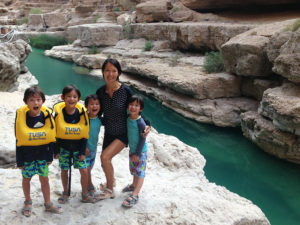 The guidebooks and blogs say it takes 40-50 minutes to reach Wadi Shab’s upper pools. Clearly, none of them traveled with four young boys. The initial section of the trek was along the relatively wide, pebbly exposed riverbed. As the canyon narrowed, the trail became more challenging, sometimes all but disappearing in a jumble of boulders. But the scenery had become breathtaking, a blend of Wadi Rum’s ‘melting’ mountains and a Moroccan oasis. Unfortunately, it was already beastly hot, and least-likely-to-complain Logan was flagging. Thankfully, we soon reached the first of the pools. 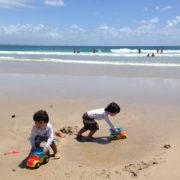 The cool water revived the boys as they waded in. They were delighted to find a tiny waterfall that resident frogs appeared to be using as a waterslide – the “Amphibi-rush”? 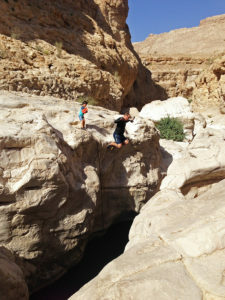 There were rocks to jump off and fun places to boulder. The pellucid water was like air; visibility was incredible. Around each corner was a new discovery. The boys were happy and I was relieved. 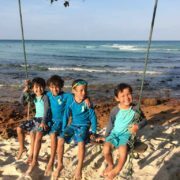 I was grateful that we had brought inflatable armbands for the boys. Several of the upper pools were long and deep, with no places for the boys to rest. They are all strong swimmers for their age, but I could see that they were tiring. Without the extra buoyancy, I wouldn’t have let them come this far. As we swam, the canyon seemed to close around us, with no obvious way around the giant boulders ahead. Huh? All this water had to come from somewhere! 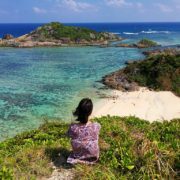 That’s when I spied a triangular cleft in the rocks and remembered a travel blogger’s video. “Boys! Wait right here! Don’t go anywhere!” I commanded. I held my breath, ducked under the water and made my way along the narrow passage. I returned a few seconds later, very excited. “Oh guys, you gotta see this!” I exclaimed. One by one, with Logan in front and me behind, we doggy-paddled forward. The pocket of air was not much bigger than my head, the current was moving against us and a disconcerting roar was getting louder. Drake looked terrified, so I held his hand and rescue-stroked the last meter. We emerged into a small but high-ceilinged cave, illuminated by shafts of light from above. A small but spirited waterfall emptied into it, its modest gurgle amplified into a Niagara-like thunder by the acoustics. I was already puffed up with pride. But the boys soon gave me another boost. On the way up, I had identified a promising cliff-jumping location just 20 minutes into the hike. That section of the trail followed a natural ledge in the canyon walls. There were launchpads everywhere and deep water seven meters below. So I did a front flip and waited to see who would follow me. Everyone did, even my 4 year-olds, to the astonishment of nearby hikers. 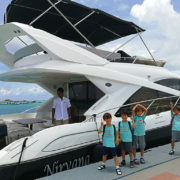 My fears of raising feeble ‘city boys’ evaporated; they were brave, confident and trusting. 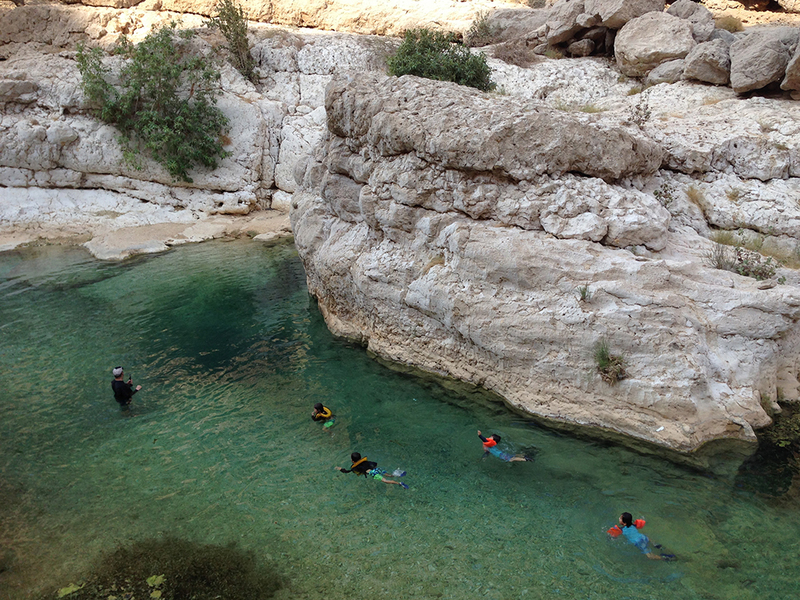 Two days later, we pulled into a huge parking lot at the entrance to Wadi Bhani Khalid. The drive over the pass and into the valley had been spectacular. We were now on the other side of the mountains that we had driven past on our way to Wadi Shab. The downside of WBK was that it didn’t feel very wild. 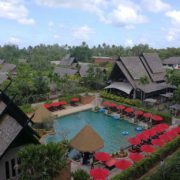 The lowest pool was crowded with locals swimming and having picnics. 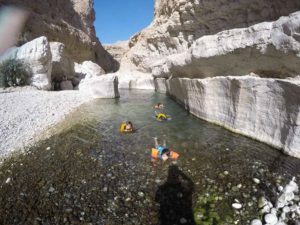 The upside was that you didn’t have to walk very far up the wadi to enter a world of smooth, concertinaed channels; slickrock slides and shortcuts through caves. It was like being in a rock-lined small intestine, but with much clearer water. Once again, the boys impressed me with their cliff-jumping prowess. One leap was so high my GoPro handle snapped in half when I hit the water! 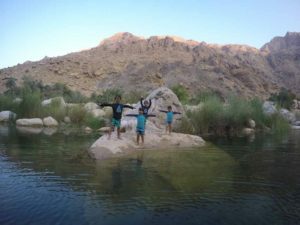 In four days, we had visited three wadis. 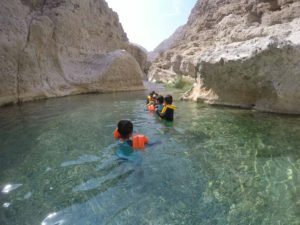 But there were still so many left to discover: Wadi al Arbaeen (near Tiwi) and Wadi Dhum (near Ibri), in particular, were recommended by Omanis and expat groups. The boys had tested their endurance and courage and we had all seen some truly beautiful canyons along the way. 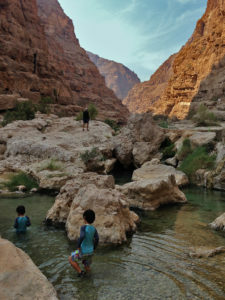 I was glad we had skipped the theme park and seen the really wild wadis instead.